Meetings are par for the course for PR execs. It’s a matter of degree, of course. Some companies have a fetish for meetings—in which even the slightest issue merits a flurry of emails to head to the conference room ASAP—while others try to minimize the number of meetings they have and focus on the work-at-hand. But few companies can avoid meetings altogether. They’re a way of business life. However, with a "more-with-less" model seeping through corporate America, brands and organizations no longer have the luxury of constantly having meetings. In an increasingly hyper-competitive economy, meetings have to be surgically efficient. Set the time for the meeting, and then knock off a half hour. 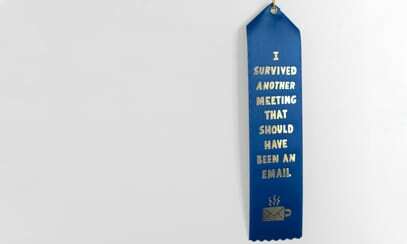 The 90-minute or two-hour meeting is fast disappearing. For most meetings, an hour should suffice. Stick to the agenda. Don’t deviate from the specific topic that’s being discussed and start to talk about an event or program that hasn’t even been budgeted yet. Have someone steer (but not control) the conversation. We’ve all been there at one time or another. A meeting is called, and there’s a de facto leader, but another manager feels compelled to add his or her two cents for every comment or consensus. There should be one person steering the meeting. This person should know how to drive (but not hog) the conversation, gather the most intelligence and cut any extraneous material. The fewer the people in the meeting, the better. For the sake of efficiency and time management, meetings tend to work better with fewer people. Amazon’s Jeff Bezos has the "two pizza rule"—never call a meeting where two pizzas couldn’t feed the entire group. Some managers think that by calling everybody and his brother into a meeting, employees can all sing Kumbaya about the latest project. But that often means employees angling for standing room and wondering how much productivity they’re about to lose. For any meeting, it should be essential personnel only. Don’t be concerned that you might hurt someone’s feelings by not inviting him. He probably doesn’t want to be there anyway.